In my 45 years of following this great game of cricket, I have never come across an interesting series like the one played between India and West Indies during the Indian home season of 1974-75. I was in the final year of my graduation and the interest in that series was so much that we cut classes on many days to hear the radio commentary. The series was held in the aftermath of a disaster series in "Old Blighty”, where the Indian team led by Ajit Wadekar were whitewashed by Mike Denness and Co. Moreover, off-field controversies played a big part in claiming a victim in the form of Wadekar, who was sacked from the captaincy immediately after the team arrived from England. Nawab of Pataudi (Mansur Ali Khan), who was removed by Vijay Merchant through his casting vote earlier in 1971, was reinstated as captain for the series. The West Indies were a strong team led by the great Clive Lloyd and had three young talents who later on became legends – Gordon Greenidge, Vivian Richards, and Andy Roberts. Their fast bowling unit had Vanburn Holder, Bernard Julien and Keith Boyce besides Roberts. The mercurial Lance Gibbs was their leading spinner. 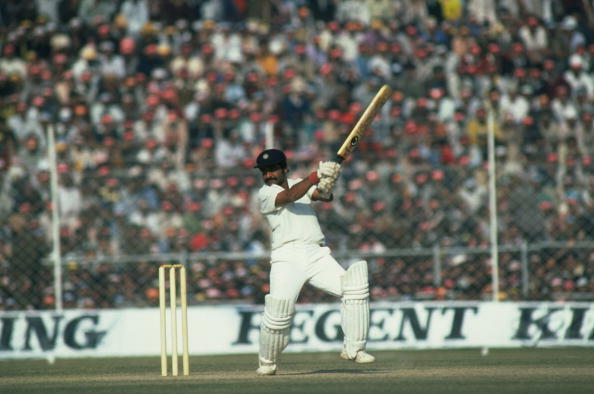 The batting revolved around Roy Fredericks, Allwyn Kallicharan, Lloyd, Greenidge and Richards. In addition, they had a terrific wicket-keeper in Deryck Murray. Against such a power-packed team, the Indian team had Gavaskar, Farokh Engineer, Gundappa Viswanath, Pataudi, Eknath Solkar and the famous spin quartet. The series consisted of 5 Test matches and the first one was held at the M. Chinnaswamy Stadium, Bangalore. As already mentioned, two players – Greenidge and Richards – who went on to become greats made their Test debut in this match. While the former made a sensational debut by scoring 93 and a century, Richards had a poor start to his international career by falling cheaply in both innings to Bhagwat Chandrasekhar. In the end, India could not cope up with the fast bowling of the West Indians and lost the Test. The second Test was played at the Feroz Shah Kotla, Delhi and India made a huge blunder while selecting the final eleven. Gavaskar, from whom much was expected, got injured while playing in a Ranji match with Tiger Pataudi also on the sidelines. Srinivas Venkataraghavan was asked to lead the team and the tormentor of Richards i.e. Chandrasekar was dropped. The young Richards proceeded to display his class and scored a masterly century, flaying the bowling attack of the Indian team to all parts of the ground and remaining unbeaten with 192. The demoralized Indians suffered another humiliating defeat and all cricket pundits predicted another whitewash. Fortunes, though, changed at the Eden Gardens, Calcutta in the third Test. Pataudi was fit enough to lead the team, with Anshuman Gaekwad and Karsan Ghavri making their Test debuts. It was a low scoring thriller and the part played by Viswanath in this Test cannot be expressed just in words. In the first innings, he scored a half-century and played a heroic knock of 139 in the second innings. Vishy’s innings was a tonic for the spin bowlers and they bowled their heart out to give India a much-needed and moral boosting victory. With the West Indies leading 2-1, there was much anticipation for the fourth Test at Madras. The match began on 11 January, coinciding with Pongal holidays in the southern state. There was much expectation from the cricket loving public of the city after the win at Calcutta. The Chepauk pitch was assisting the West Indian fast bowlers and Andy Roberts was at his best. Wickets fell like nine pins, but one man stood tall among the ruins. Viswanath played an immortal innings and the same has been ranked as one of the top 100 innings in the Wisden Almanac. He played an innings full of class, playing the express pace of Roberts with ease and remained unbeaten on 97. Hearing radio commentary in those days, I could visualize the exquisite cover drives, square cuts, pulls and on drives. NS Ramaswami in his column in Indian Express described the knock as an “epic Innings” and he had further written that those who were fortunate enough to witness the innings at Chepauk would one day tell their grandchildren how lucky they were to see such a knock from an unassuming cricketer. The next highest score in that innings was 19 by Ashok Mankad. Roberts took seven wickets in that innings, but Vishy’s classy knock was a tonic for the bowlers and the spin trio of Erapalli Prasanna, Bishen Singh Bedi and Chandrasekar took 18 wickets among them to register another victory for India and level the series at 2-all. Viswanath was the cornerstone for India leveling the series by playing crucial knocks at both Calcutta and Chennai. The scene then shifted to Bombay for the decider. The fifth Test was a six-day affair and the Indian batting was strengthened by the inclusion of Gavaskar who was declared fit to play. But the strenuous efforts put in by the spin bowlers in the Tests at Calcutta and Madras took a toll on them and the West Indies batsmen used it to their advantage and posted a huge total of 604 with Lloyd scoring an unbeaten double ton. Even though the Indians fought well by scoring 406 runs with Solkar recording his only ton in Test cricket, they could not sustain the momentum and lost the match and the series. It was a hard fought series which was played in the right spirit. West Indies found new stars in Greenidge, Richards and Roberts as they formed the nucleus of the team which won the inaugural World Cup six months later in England. Viswanath with his batting (two tons and a 95) shone like a Kohinoor Diamond and despite the lack of form of the skipper and the absence of Sunil Gavaskar in 3 Tests, India’s overall performance was laudable.